Paribus is a fairly new site that’s received a lot of attention lately. It’s a website that monitors your purchases, and if they detect a price drop, they’ll send you a refund for the difference. But is Paribus a scam? A number of people have complaints about Paribus, so I decided to do some in-depth research on this company and share my findings with you in this review. Let’s get started! Paribus was founded by Eric Glyman and Karim Atiyeh in 2014, and was purchased by Capital One in 2016. Paribus works as an app for iOS, and can be used on computers as well (it was removed from the Play Store, but they are working to rebuild the app for Android). In this review, I will be going over how Paribus works, complaints against it and whether it’s safe or a scam. As I said, Paribus tracks your online purchases and sends you a refund when they detect a price-drop for any item you ordered in the past. Most stores have price guarantees, meaning that if there’s a sale – or if a product simply goes down in price – you can file a price adjustment claim and get refunded the difference (how much you paid minus the current price). The trouble is, filing these claims can be a hassle, and it can be time consuming to regularly go through all your past purchases looking for price drops. This is where Paribus comes in. They file these price adjustment claims on your behalf, therefore saving you the hassle and potentially saving you hundreds of dollars. Here is a complete list of stores Paribus works with. Another thing Paribus does is track your orders from Walmart and Amazon, and notifies these companies on your behalf if there is a late delivery. You’ll get a $10 credit for this. Okay, so Paribus sounds pretty neat. But, of course, there’s a catch. What’s the Catch? How Does Paribus Work? This is so Paribus can keep track of all your online receipts and issue a refund when they detect a price drop. You can also connect your credit/debit cards and Amazon account to Paribus in order to take full advantage of their price-matching service, but this isn’t required. Once Paribus has your email, they’ll scan your inbox for past purchases that are eligible for price adjustment refunds. If they detect any, they will let you know and then all you have to do is approve them. So, if you don’t mind them having access to your email (and cards), this is a great way to potentially save some money. If privacy is a concern for you though, then I wouldn’t suggest you use Paribus. Either way, you might want to look into my complete list of make money online ideas. At the time of writing this, Paribus has a BBB (Better Business Bureau) rating of B, although they are not BBB accredited (this doesn’t mean much though; a lot of legitimate businesses aren’t BBB accredited). Paribus sends all the refunds straight to your bank account (as long as your card is linked). You don’t have to wait to reach a certain payment threshold either; your earnings are sent out as soon as the price match is approved. You can also have refunds sent to your PayPal account if you prefer. Some people have complained that even though they’ve had Paribus for months, they never get any refunds. Aside from those possibilities, there may also be a technical issue, in which case you’d want to contact Paribus support and ask them about it directly. Yes, Paribus has somewhat intrusive access to your email account. They can read your emails, send emails, and they have the ability to delete them as well. But Paribus is not interested in any of that. All they do is look for receipts. And if they find any receipts which are eligible for a price adjustment claim, you have full control over whether they file the claim or not. If you are not comfortable with Paribus having access to your email, my advice is to just not use the service. If you are not from the US or Puerto Rico, you won’t be able to use Paribus. There are other services similar to Paribus though, so you may be able to find a good alternative. Is Paribus a Scam? Final Thoughts…. Paribus is not a scam. It is a legitimate way to save some money, and it requires virtually no work on your part. However, if you are uncomfortable with the level of access Paribus has to your email account, then you may want to skip Paribus and instead look for other money-making options. My favorite way to make money online is detailed in this post. Feel free to check it out; it just might be life-changing for you (it was for me). Whatever the case, I hope this review was helpful! Have you ever used Paribus? What do you think of it? Feel free to leave a comment below, and if you have any questions, I’d love to help out! What I am wanting to know is the merchants’ opinions toward Paribus. I consider a purchase from a store to be a sort of mini-contract: I agree to buy this product for this price – not the price next month or next year. It seems to me that using a third party to take advantage of a price guarantee is along the lines of the guy who bought a warehouse worth of Coca Cola to win the contest for an expensive sports car. Unless merchants are getting some benefit from allowing Paribus to file for refunds, I can see them either stopping the price guarantee or disallowing a third party to file. FedEx had to do this a number of years ago because of third parties filing for late deliveries. People’s greed get in the way of good faith business, forcing merchants to change their policies, and making legitimate claims more difficult. I do appreciate the review! I was looking for information and found this. Thanks! Very interesting thoughts. I’m not a merchant, so I wouldn’t know any better than you. I assume probably millions of people are taking advantage of price adjustment claims through Paribus and similar services, so if it were really hurting the companies they would stop allowing this to happen. In that case, I suppose it’s worth taking advantage of as a consumer wanting to save money, but if it is a personal ethical issue than I can understand not wanting to use Paribus. Email accounts are free, if your really worried about privacy, you can always create a new gmail, outlook, or Yahoo account. Only have receipts sent there for the receipt with no other personal information. That wouldn’t work for any previous purchases, but all your personal emails would be untouched. Also the permissions are pretty standard look at Facebook app (or most other apps) permissions on your phone… it can read, write, delete texts. Access your camera, and there policy states anytime with or without your knowledge. A good Blog article explaining, from an end-user’s point of view, how it works, the benefits and things to watch out for. I found this article because I received information from Capital One suggesting I sign up for Paribus. Anytime a company offers something beneficial for free, I immediately want to know what is their business model? How do they make money? Paribus is not a charity, so anything they do is ultimately to make money. You know the old saying…”follow the money.” It appears from the information shared thus far that the Paribus business model is similar to online advertising, by sending me targeted ads to specific websites/goods. If I click through to them then Paribus gets paid. And I can well imagine that they monetize also information gleaned from scanning my mailbox. Even if they don’t sell the raw data directly – contacts – the survey data they could amass across all their customers would be extremely valuable. No, for me, the potential cost to me for Paribus misusing my data – or worse, they get hacked and my info is all of the dark web, is not worth the few dollars I would get as refunds and credits. I’ll pass. I see you have to have a specific type of email account? I have an att.net account, not a gmail, not a yahoo (although the att.net account was originally a yahoo account) or google account. Sounds kind of discriminating! I wonder why just thee types? I wasn’t worried too much about the emails being looked at, except for the delete thing. No company should be asking to delete emails, even if it is formal contract language. Just the fact that the gentleman‘s emails disappeared and could possibly be blamed on Paribus, makes it OK for them to get rid of anything they want to, without repercussion. In fact, if you read through their entire policy, (which I did), they can pretty much do ANYTHING they want, TO ANYTHING and not be held liable. That much power isn’t worth a few hundred dollars, in my opinion. Just my two cents!!! I really do appreciate your review, and this blog. Thanks for taking the time to set it up for us and to give us the in the in and outs. Honestly I have no clue why only certain emails are accepted. In regards to their policy, they obviously don’t want to be held liable for anything, and I suppose since they have access to your personal email (and therefore potentially lots of sensitive info), they need to be sure they’ve got themselves covered in case of a lawsuit. Like I’ve said in the review, people worried about their privacy, and apparently now anyone worried about having emails disappear, shouldn’t use Paribus. There are lots of other great ways to make/save money. Concerning. Thanks for sharing that, and be sure to keep everyone updated. I am very tempted to use the service however I was wondering as I do my online shopping I use PayPal for a lot of money online shopping how would the money then be refunded with a go back to my Paypal account or my actual checking account how would that work in that instance? Refunds are sent to your actual bank account, but I believe you can have the refunds sent to your PayPal account if you wish. I just discovered some emails that were important from my Dr that I had put in a folder disappear a few weeks ago and thought it had to do something with my phone since it had been acting up so I had my Dr send them again. I had to look at the emails again yesterday that I put in the folder again and they are gone, still didn’t know why they disappeared and looked at other folders and they are all gone. I was just reading on Facebook before coming here, about Paribus on a post and people were talking about emails disappearing, right away I knew why my emails disappeared. It’s all great they can get you money back but when they take away emails that have nothing to do with a purchase, even worse emails you put in folders your wanting to keep that is just wrong. I for one will be getting rid of Paribus now that I know they can delete ALL your emails. Wow, that’s not good. Have you tried contacting Paribus about this? This is the first time I’ve heard of this happening. Thank you for writing this. I’ve been tempted to try Paribus in the past, but of course, red flags go up with the gmail warning. Do you know if, once I sign up, I can un-sign up and remove access permissions from Paribus? Yes, you can entirely delete your Paribus account in your profile page. Everything sounds great, but the whole giving them your user and password access to your credits, sounds dangerous. So I did some searching and found no CAPITALONE claims on Paribus. Only Paribus clamings on Capitalone. All the sources that says they’re partnered is only from the single Paribus blog that says they’re allied. Until the issue is resolved, I would say this is a scam. Also, the original email invitation they send to me got deleted, maybe I deleted it by accident, but it was no longer in the trash or spam or all-mail. Luckly I found a saved draft I created from it which has the copy of the original. Fingers cross, but if Capitalone is unable to confirm my request to look into this address, this program is yet another too good to be true. My confusion and why I haven’t tried this yet is that it says it can delete your emails… Why? What does it delete? Are you notified before they delete the email or can you un-delete it? I don’t like that part.. I don’t want my emails to go missing.. They won’t actually delete your emails; that’s the default text they have to show when it comes to granting them access to your email account. Just like when installing an app or extension and it says “this ___ can read and change the data on all the sites you visit” or something along those lines. This isn’t a review for paribus, its a paid advertisement. Paribus is useless, especially for Amazon. Basically you’re giving them (Paribus) the right to ”scan” your email for receipts while hoping they don’t hand your information off too a third party. As for them handing your information off to third parties, they would not be around if they were doing that without your consent. There are no cases that I’m aware of where they sell your info. If you know of any, please do share! If you read my review again, you will notice I cautioned people not to use Paribus if privacy is a concern for them THREE times. If folks don’t want to use Paribus, I don’t blame them. If they do, I don’t blame them. Paribus is not for everyone. i believe there is an android app also. i use it to watch prices before buying, especially on amazon, as they don’t do price matching after the purchase, and i have seen them changing their prices every few hours. the difference is sometimes huge. The problem i ran into is i dont use one of the three emails they sponsor. A lot of people dont for purchases due to the security of the 3 spondored email sites (gmail,outlook,and yahoo) the email service i use is more secure and i have sat back and seen/heard horror stories with purchases made through the 3 sponsored emails. I am a little more knowledged than most on internet mail. I only have Amazon Prime. Paribus contacts each company for me every time there is a late delivery (I was recently homebound for almost 5 months after surgery and shopped at Amazon at least weekly). Almost every vendor would give me a $5.00 good faith credit and some even offered to cover my next month of prime membership cost along with the $5.00 (those were the Amazon sellers, of couse). The outside sellers just offered good faith credits of $2 or $5. Within the first 2 months of having Parabus as a Prime member l had 3 months in a row where l did not have to pay for Prime services and over $50 in credit. I dont understand why being a Prine member would deter anyone! I shop ONLY at Amazon, and am a Prime member. Because several shipments have been late, I took the time to seteup a new email address only for Amazon purchases then joined Paribus. Total waste of time. Paribus explicitly stated that if Amazon shipments were late they would negotiate with Amazon for such recompense as discounting annual Prime fee. One week after I connected Paribus to the Amazon-only Gmail account, they report they don’t see any email receipts. My inbox contains 5 receipts. control through Amazon.) And only now do they tell me they can’t track Amazon purchases any other way. Completely contradicting the additional offer. Which, by the way, came to me via my Capital One card; they just bought Paribus. I’d hoped they were legit, but I’ve severed ties. Every “reminder” email they sent prompting me to link my actual Amazon account contained links my WOT account flagged as insecure/identified as phishing. Will Paribus work if you use a gift card rather than a credit card to make a purchase? I don’t believe so. Generally, gift cards are ineligible for things like cash back/price match. However, you could contact them at support@paribus.co just to be sure. 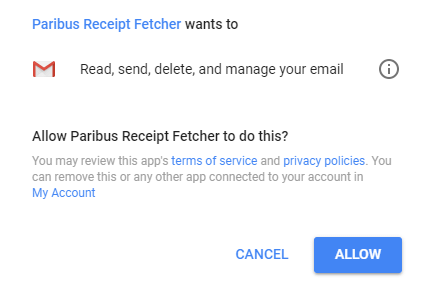 Does Paribus monitor receipts that are emailed to your email address on record even if you made the purchase in the brick and mortar store? I would say probably not, but I’m not completely sure. Try contacting Paribus and see what they have to say! I signed up with Paribus some time ago. Recently during a shopping trip to a high end retailer, I purchased a pair of shoes. Paribus immediately sent an email once the shoes were reduced and the store refunded the difference, it was almost $100. So does that mean it wasn’t an online purchase? Paribus also works in store purchases as well? Also the other thing is are they only for shopping online? So whenyou go a physical store they can’t use those recipes.. Correct, Paribus only works for online purchases. Does it work for HSN & QVC. THATS my main focus of shopping and Amazon. I will save and use it later like Thanksgiving ?? HSN and QVC don’t appear to be listed among the stores Paribus monitors. Here’s the full list. Regarding the Amazon refund complaint. In 2017 Amazon stopped its price matching policy. This means the only refunds Paribus can get for people on Amazon is for late delivery when you pay shipping. IF you are Amazon prime, you don’t pay shipping which means that, for Amazon, Paribus can’t get you anything. However, they still work for a number of other stores like Walmart, Target, Kohls, Sears and many others. If you ONLY shop at Amazon it is not worth it. Thank you, Maggie! Makes perfect sense! Im thinking I should delete my account for Paribus. I have several claims made by them and no funds have been returned to me even months later. So I feel like they are in my information and emails for nothing. That’s odd that you haven’t received anything from the claims…have you tried contacting them about it? Otherwise you could look into alternatives such as Earny or Sift….